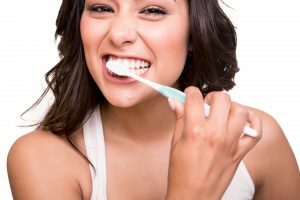 Toothbrushing – Brushing your teeth correctly and frequently enough is very important to your oral health. The bristles on the toothbrush agitate the leftover food particles and bacteria that can cause havoc for your teeth and gums. To get the best results, you should brush for two minutes per session at least two times a day. Flossing – Is brushing enough? Some people may think so, but the reality is that it can only address up to 60 percent of your teeth. To clean the remaining 40 percent, which includes the tight spaces between your teeth, you’ll need to floss. Mouthwash – A great supplement to add into your regimen is rinsing with a mouthwash. It will ensure that your mouth stays moist and that excess food particles are washed away after you eat. Eating Healthier – A final way to enhance your oral health is by making healthier food choices. Eating items like vegetables and fruits with naturally occurring sugars is a much better choice than consuming snack foods. That’s because whole foods have properties in them that can actually contribute to better oral health, as they raise the pH level in your mouth to make it less acidic. When you take steps to improve your oral health and visit your dentist every six months for total care, you are taking proactive steps toward excellent oral health. Furthermore, these appointments are a great time to ask your hygienist about any questions that you may have. Dental maladies can sometimes develop for years before you notice them. So even though you may not have any recognizable symptoms yet, it’s still important to visit your dentist as soon as possible for preventive care. You’ll leave with the full confidence of knowing that your mouth, teeth and gums are healthy. A graduate of the University of Minnesota School of Dentistry in Minneapolis, Dr. Robert Heil has been practicing dentistry for nearly two decades. He takes pride in helping each patient achieve the absolute best dental health possible, while remaining affiliated with several professional organizations. Dr. Heil practices at Dental Expressions and can be reached for more information through his website.